NEW CLIENTS PLEASE ARRIVE 10 MIN EARLY TO FILL OUR REGISTRATION FORMS! Tai Chi consists of fluid, gentle movements that are slow in tempo. Over the past ten years more and more research has been done that encourages people with a wide range of medical issues such as arthritis, cardiac rehab, Parkinson, stroke rehab, high blood pressure, balance problems, and depression to practice Tai Chi. Mayo Clinic has recommended Tai Chi to improve strength, flexibility, balance, well being and overall fitness. Our class combines these traditional movements with simple, easy to learn relaxation techniques. Many students have reported better balance, significant pain relief, increased sense of well being, and improved physical ability. Monday 5:45pm ~ Hot Vinyasa Flow- Advanced Beginner- Intermediate, Pre-Registration Required! A strong, steady, enlivening power flow which wakes up the whole body and mind. In this class you can expect to center, then ride the wave of power to its peak, until encountering deep passive stretches to close the practice. This class is good for those looking for the complete yoga class. We will cultivate strength, flexibility, balance, stability, mind-body awareness, peace, and happiness. Pre-registration is required do to limited class size. To register you can click here. Barre combines Pilates, yoga and ballet moves to give you beautiful, sculpted, lean muscles – without the impact and injuries dancers endure. The other, just as significant, aspect of barre, is the focus it demands. This is an all level class. Join us for a yoga class that includes both the yin and yang of your asana practice. Class will begin with centered breathing followed by a moderate level slow flow vinyasa practice including sun salutations and standing poses. The second half of class will consist of yin stretching poses designed to open the deep connective tissues of your hips and low back while bringing our minds into a more meditative state. We will conclude with savasana. This is a 60 minute class. Yin yoga is a slow-paced style of yoga with postures, or asanas, that are held for longer periods of time—for beginners, it may range from 45 seconds to two minutes; more advanced practitioners may stay in one asana for five minutes or more. This is a deep stretch class. See Free Community Class page for more details. This is a grounding, gentle class. This class offers a cooling experience to help wind down from the busy week and prepare for the weekend. It is designed for beginners through intermediate students.In Gentle Flow, you’ll be guided through postures beginning with the basic poses, but allowing for more challenging poses based on your practice level.Props are encouraged to allow the body to fully achieve each pose comfortably.This is a great class for students looking for a more gentle experience, those who are new to yoga or those who need a change of pace, yet still have the option to take it to the next level.Also the perfect class for students with injuries or limitations. Dedicate an intention for your day during this practice. We will be focusing on morning stretches while incorporating slow, mindful movements. Yin Yoga involves variations of seated and supine poses typically held for a few minutes, accessing deeper layers of fascia. Because yoga is a mind-body practice, setting an intention can bring your yoga practice to a deeper level. An intention can guide your practice in the classroom as you stretch through increasingly challenging poses. Over time, an intention can also better direct your actions and decisions outside the classroom whenever this, your heart’s aspiration, is called to mind. Each week will focus on different a few different foundation yoga poses and how the poses flow into each other. Fundamentals of yoga & alignment are the focus of this class geared toward beginners or those who are looking to fine tune the basics. Anyone is welcome to come to this class. Wednesday 7:00pm ~ Hot Vinyasa Flow- Advanced Beginner- Intermediate, Pre-Registration Required! This style of yoga practice was originally closely modeled on the Ashtanga method. Power yoga incorporates the athleticism of Ashtanga, including lots of vinyasas (series of poses done in sequence) but gives each teacher the flexibility to teach any poses in any order, making every class different. This class is good for those looking for the complete yoga class. We will cultivate strength, flexibility, balance, stability, mind-body awareness, peace, and happiness. During Zen Barre Yoga, the instructor incorporates yoga asanas with weights, the barre and lots of reps – you will defiantly work up a sweat! At the end of the class, she cools you down with a relaxing mediation. Each class will focus on postures inspired by a different classical element according to the Vedas: Earth, Wind, Fire, Air & Aether. Hatha is a general category that includes most yoga styles. It is an old system that includes the practice of asanas (yoga postures) and pranayama (breathing exercises), which help bring peace to the mind and body, preparing the body for deeper spiritual practices such as meditation. Today, the term hatha is used in such a broad way that it is difficult to know what a particular hatha class will be like. In most cases, however, it will be relatively gentle, slow and great for beginners or students who prefer a more relaxed style where they hold poses longer. Learn to unwind and let go with an evening of guided meditation. The practice of being calm and mindful is over 4000 years old, rooted in the foundations and principles of Chinese medicine. These tools to stay in the present may be more needed now then ever. This is a practice to reduce stress, tension, become more mindful and just BE. Class will begin with centered breathing followed by a moderate level slow flow vinyasa practice including sun salutations and standing poses. The second half of class will consist of 3 minute yin stretching poses designed to open the deep connective tissues of your hips and low back while bringing our minds into a more meditative state. This class is focused on opening up and aligning the energy centers, or chakras, in the body. Each week we will learn about a different chakra, including it’s location in the body, color association, and how the different chakras are directly related to our every day lives. *Each class we will study a chakra and do yoga poses and meditation relating to that chakra. Diana will also be incorporating stones, herbal tea, and essential oils to help balance the chakra. Diana is a certified yoga instructor and has been teaching yoga for 6 years. Leave this class with an ancient knowledge and balanced mind, body and spirit. This is a 45 minute class. Barre combines Pilates, yoga and ballet moves to give you beautiful, sculpted, lean muscles – without the impact and injuries dancers endure. The other, just as significant, aspect of barre, is the focus it demands. This is an all level class. Pull out your gym mat and get ready to do a series of movements that will stabilize and strengthen your core. The moves may look simple, but they take a lot of precision and control. It’s not like doing a bunch of crunches; there’s a strong emphasis on technique. You’ll get stronger, more sculpted muscles and gain flexibility. You may also have better posture and a better sense of well-being. This is a therapeutic style of yoga which allows the body to surrender to the pose. Practicing poses provides a completely supportive environment for total relaxation. The more your body is supported in the poses the deeper the sense of relaxation. Relaxation is a state in which there is no movement, no effort, and the brain is quiet. This practice soothes your nervous system, helps you quiet your mind and invites you to release deeply held tension. During these periods of deep relaxation you will be healed and nurtured from within. Slow flow yoga is a meditative flow that practices slowing down by using a slow steady breath, holding postures, transitioning smoothly, and opening gently and mindfully with the ability to move deeper into one’s body and self. It’s a practice that builds strength, and each movement is initiated by slow controlled inhales and exhales. 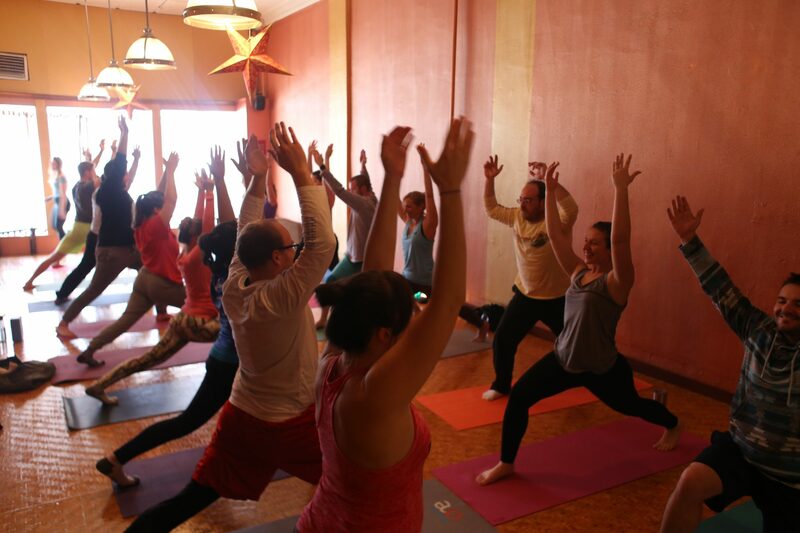 Saturday 10:30am ~ Heated Vinyasa Flow- Advanced Beginner- Intermediate, Preregistration required! This class will be relaxing and rejuvenating. It will begin with series of poses intended to warm and stretch the muscles. We will then move into a flow series and finish by coming back down to the mat for a nice long savasana. Monthly Unlimited Membership (3 month contract): $75/mo autopay. Monthly Unlimited Membership (1 year contract): ONLY $55/mo autopay. 10% off all East Wind Acupuncture & Studios merchandise and services. 1 free class pass per month for a friend or family member. We also offer studio rentals, private and semi-private classes, bachelorette parties and more….